Filling this year’s Panini World Cup sticker book costs £773.60, twice the cost for Euro 2016, according to maths expert Prof Paul Harper. A pack of five stickers has risen from 50p to 80p – a 60% increase. If you buy 137 packets and never get the same sticker twice, it will cost £109.60, but this is “extremely unlikely”, says the professor. Prof Harper, from Cardiff University’s School of Mathematics, worked out a formula to include the least probable number of duplicate stickers. In the end, he demonstrated that on average you would need to buy 4,832 stickers – or 967 packets – to complete the Italian-made book. With 10 friends swapping, it could still cost them an average of £247 each to complete the album, according to the professor’s calculations. 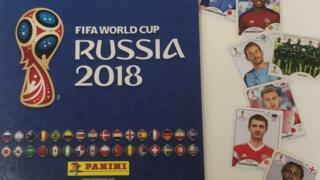 While the Euro competition only had 24 squads – fewer than the World Cup – there were only two fewer stickers in the book printed two years ago. “I can still recall the joy of finally completing my first Panini album as a young boy for the 1982 World Cup in Spain,” said Prof Harper.